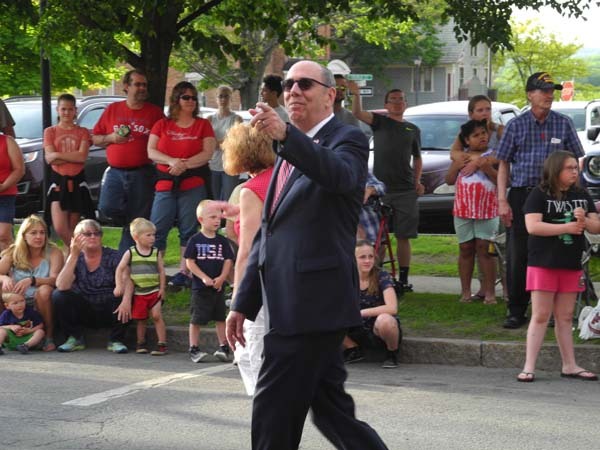 The Leader-Herald/Michae Anich The annual Johnstown Memorial Day Service is conducted Friday night at the downtown bandshell. 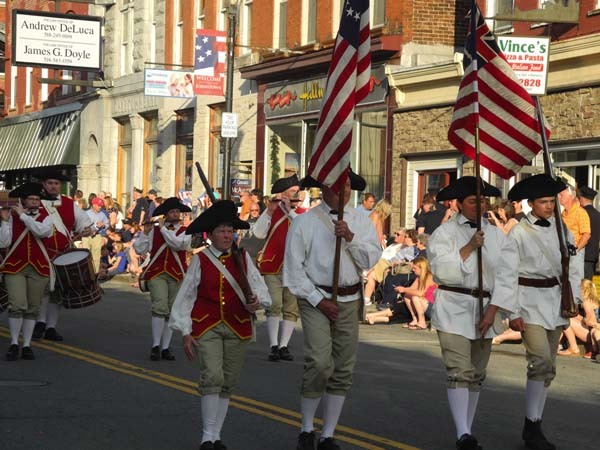 JOHNSTOWN — Two planes flew in formation over Main Street to kick off the annual Johnstown Memorial Day Parade Friday night, which was witnessed by hundreds downtown. 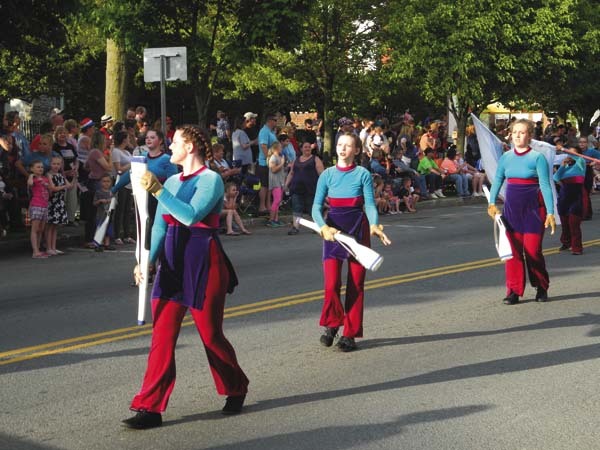 Families gathered on a pleasant late spring evening, some in lawn chairs and others perched on curbs, to take in the five-division parade put on by the city. World War II veteran Alan E. Cole served as the parade’s grand marshal. 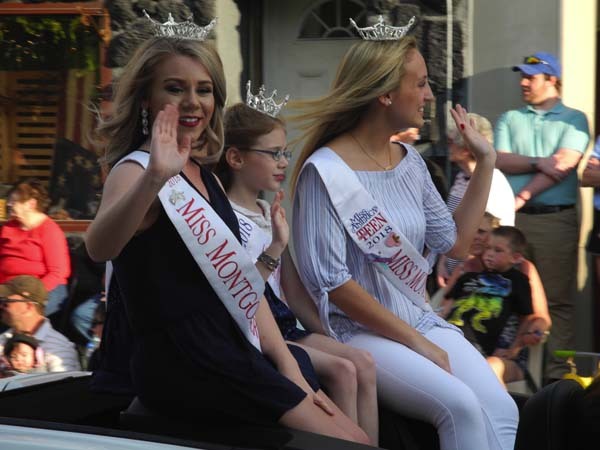 The parade featured a variety of floats, emergency vehicles, fire department trucks, veterans groups, local societies, politicians, candidates, pageant winners, sports and theater groups, religious participants, and private businesses. 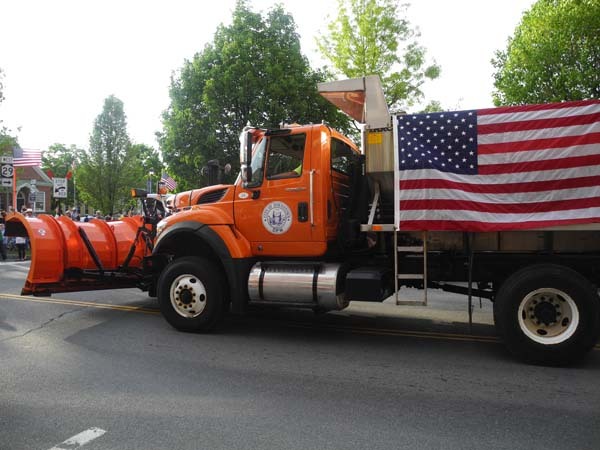 Beginning on East Main Street, between Chase Street and Jansen Avenue, the last unit lined up on South Chase Street, between East Main Street and East State Street and all units dispersed near the Fulton County Courthouse. 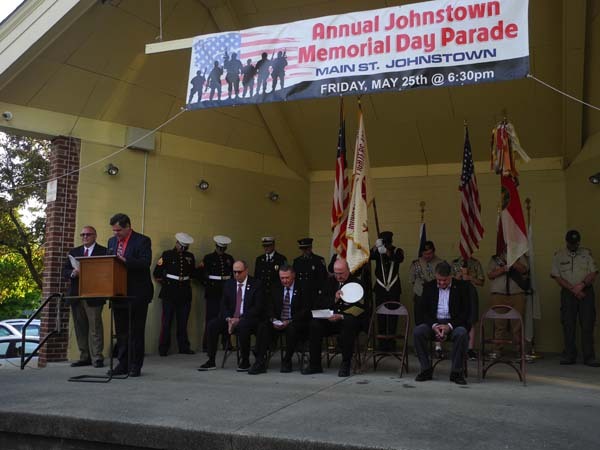 Following the parade, a Memorial Day Service was conducted at the downtown bandshell in Sir William Johnson Park. Peter O’Lucci served as master of ceremonies of the program in the park. 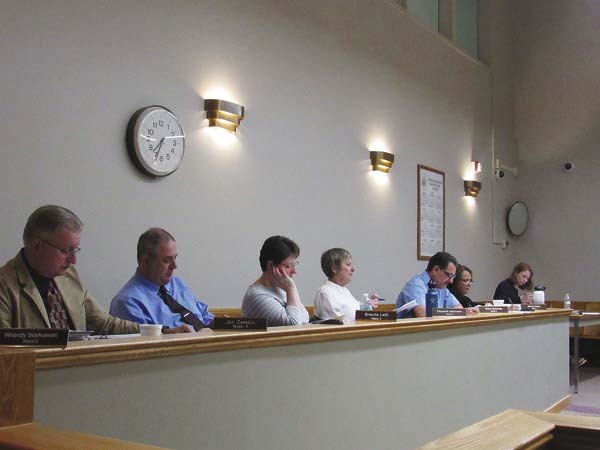 “Be thankful for our town leaders who put this all together,” O’Lucci said. 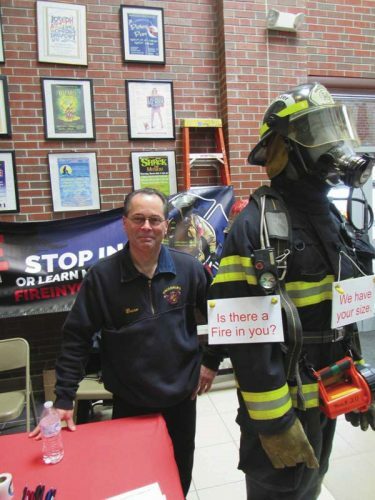 “Military families are something special, aren’t they?” said Talarico. But, he said it is hard to define how a family must feel when they lose a loved one in war. Talarico said people should barbecue this weekend and enjoy themselves. But he said Americans must also remember the best way to thank a veteran is to protect the service persons still on duty. The “Pledge of Allegiance” was led by John Morris, U.S. Naval Reserve (retired). 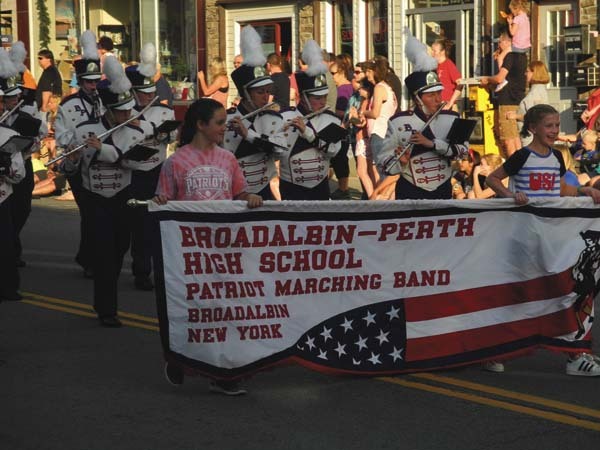 Musical selections during the service were provided by the Johnstown High School Marching Band and Schenectady Pipe & Drum. Boy Scout Troop 104 presented the wreath. 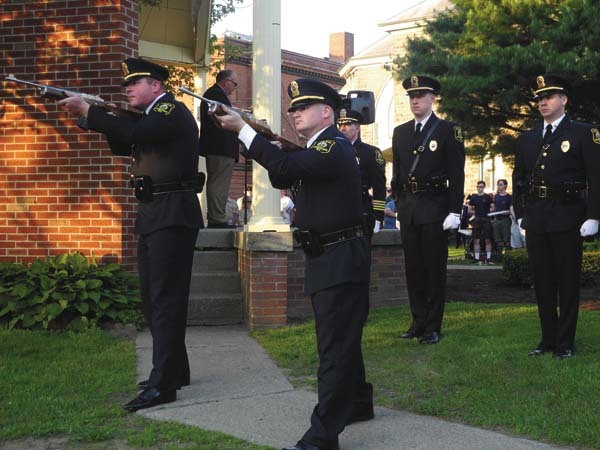 The Johnstown Police Department Honor Guard offered a three-shot salute. The invocation and benediction was provided by Pastor Robert Walter of the First Baptist Church of Johnstown. 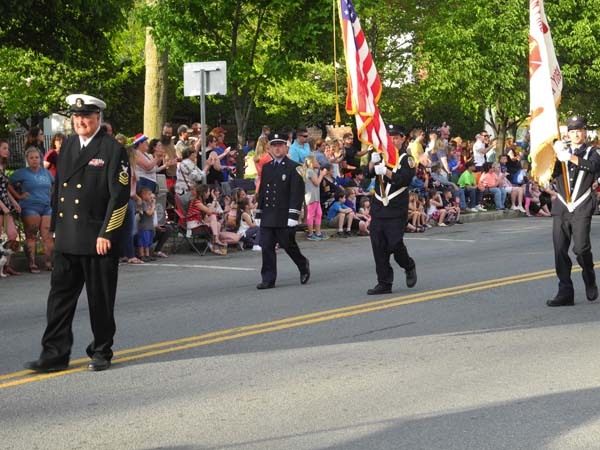 Gloverville’s Memorial Day Parade is set for Monday at 9:30 a.m.